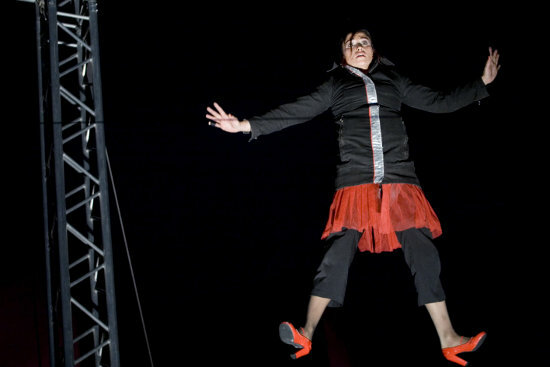 Held in La Seyne-sur-Mer's Chapiteau Des Sablettes, right by the Mediterranean sea on the northern edge of France, Janvier dans les étoiles was started in 2000 with the intention of bringing circus to an area of France isolated from the great cultural centres. Organised by Théâtre Europe with the collaboration of Archaos' Centre de Recherche Européen des Arts du cirque (CREAC) in nearby Marseille, the festival was originally placed in mid-January to catch some of the traffic on its way to Monte Carlo, but occasionally slips further into the year. Among the 2011 edition there's Señor Stets' Cuerdo, a puppetry-circus-object solo creating its myriad illusions from one man, one bag, and three ropes; Pfffffff, the light-hearted acrobatic boys-and-girl tussle that Sideshow judged slightly lame on seeing it in Auch; Atempo Circ's much better, much tighter, much cooler three-hander Atempo; and âm, the graduation production from students of the Centre National des Arts du Cirque, which of all the circus schools seems to have the best hit rate in turning out talented and exceptional artists. Reflecting the festival's interest in connecting Seyne-sur-Mer with the wider circus world, there are also a couple of professional events – serious ones about e.g. the impact of reformed local government on regional circus communities – plus satellite events including an exhibition to honour the late Pierrot Bidon.